In 2014, China’s central government called for private capital to invest in commercial satellite operations. Since then, a slew of rocket startups have been established—yet so far, none have successfully launched their products into orbit. That could change next week. OneSpace, a Beijing-based private space company, says it is launching a solid propellant rocket into orbit in late March (link in Chinese). It’s the second attempt from a private Chinese space company after another firm failed last year. OneSpace’s rocket will carry a satellite from ZeroG Technology that it says weighs less than 100 kg (220 lbs). ZeroG, a Beijing-based small-satellite developer, said on a microblogging site that the launch would take place (link in Chinese) on March 25. OneSpace denied the launch date, but declined to share more exact timing with Quartz. ZeroG didn’t respond to queries about the mission. OneSpace did say it is preparing for the launch at the Jiuquan Satellite Launch Center in the Gobi Desert in northern China. Their rocket, OS-M, is 19 meters tall, weighs 20 metric tons (22 tons), and consists of three solid propellant stages and a fourth liquid propellant stage. It can carry a payload of 143 kg (315 lbs) to low-earth orbit at an altitude of 300 km (190 miles), according to the firm (link in Chinese), which says preparing for the launch requires less than 48 hours. The news comes as multiple private space companies look to enter the launch market for commercial satellites, which in China is still in its early stages. Yet private space companies are getting capital and government support—such as launch sites and funding—which is typical of private space efforts in the US, Japan, and France. Most Chinese rocket makers, like OneSpace, start with solid propellant designs typically developed for use in military ballistic missiles, which are less complex to manufacture, lowering up-front costs. These designs could be uncompetitive, however, if larger reusable rockets designed by SpaceX and Blue Origin continue to bring down the cost of launching satellites into the orbit, or if small liquid-fueled rockets prove to be more attractive to customers. OneSpace declined to reveal the design, manufacture, and launch cost of OS-M, and only said its launch cost was lower than American space firms like Virgin Orbit and Rocket Lab. Those companies, however, are building vehicles capable of launching larger satellites. Richard Branson-backed Virgin Orbit is developing LauncherOne, with a cost of $12 million to $15 million, to launch payloads of 300 kg to 500 kg (660 to 1,100 lbs). In November, Rocket Lab carried the first successful commercial launch with its Electron rocket sending six satellites into orbit; its next launch is planned for March 24. The Electron can carry payloads ranging from 150 to 225 kg (330 to 496 lbs) at a launch cost of $5 million to $6 million. OneSpace said it has raised close to 800 million yuan ($120 million) from investors including HIT Robot Group, a government-backed robotic company in Harbin city, and Zhengxuan Investment, a Shenzhen-based firm established by Xia Zuoquan (link in Chinese), a co-founder of BYD, China’s largest electric vehicle maker. OneSpace’s fellow Chinese rocket makers include LandSpace, which failed to reach orbit in October 2018 after something went wrong on the third stage of its three-stage solid-fueled rocket. The company is working on a liquid-fueled rocket it hopes to launch this year. Beijing Interstellar Glory Space Technology (also known as iSpace) plans to launch a solid-fueled rocket (link in Chinese) into orbit before June, and to launch a liquid-fueled vehicle in 2021. The problem, however, remains whether there will be a commercial market big enough for the slew of launches. 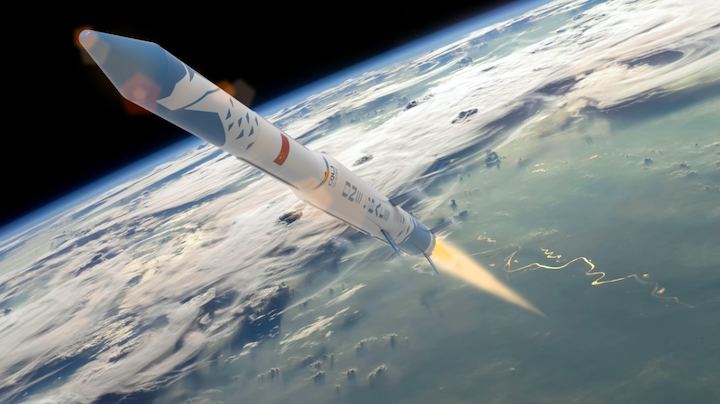 Curcio, the space analyst, said an estimated five Chinese firms have laid out plans to do around 120 to 150 launches by early 2020s, and he doubts there will be sufficient market demand for that. Painted blue and white, OneSpace’s rocket has a dragon and mountains on it. The dragon represents Chinese culture, said the firm(link in Chinese), while mountains are geological features of the southwestern city Chongqing, where OneSpace just finished building a manufacturing facility. OneSpace named the OS-M rocket “Chongqing Liangjiang Star” after the state-backed Chongqing Aviation Industry Investment group, which co-invested in the Chongqing manufacturing facility. In May 2018, it had used the same name on a smaller rocket, OS-X, which the firm claimed to be the first private suborbital launch in China.